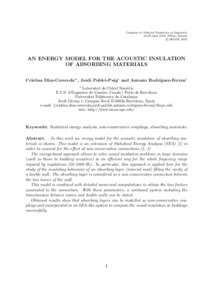 In this work an energy model for the acoustic insulation of absorbing ma- terials is shown. This model is an extension of Statistical Energy Analysis (SEA)  in order to account for the effect of non-conservative connections [2, 3]. The energy-based approach allows to solve sound insulation problems in large domains (such as those in building acoustics) in an efficient way for the whole frequency range required by regulations (50-5000 Hz). In particular, this approach is applied here for the study of the insulating behaviour of an absorbing layer (mineral wool) filling the cavity of a double wall. The absorbing layer is considered as a non-conservative connection between the two leaves of the wall. This model is combined with detailed numerical computations to obtain the loss factors associated to the connection. With these parameters, a combined system including the transmission between rooms and double walls can be stated. Obtained results show that absorbing layers can be modelled as non-conservative cou- plings and incorporated in an SEA-like system to compute the sound insulation in buildings successfully. Díaz-Cereceda, C.; Poblet-Puig, J.; Rodriguez, A. An energy model for the acoustic insulation of absorbing materials. A: Congreso de Métodos Numéricos en Ingeniería. "Congreso de Métodos Numéricos en Ingeniería: CMN 2013 = Congress on Numerical Methods in Engineering: CMN 2013". Bilbao: Sociedad Española de Métodos Numéricos en Ingeniería (SEMNI), 2013, p. 1-13.